Covenant Relationships: Do You Truly Have Faith? Get in the Wheelbarrow! I heard an interesting story today and thought to share it. The story is about Mr. Tight rope walker and Mr. Promoter. Mr. Tight rope walker was a man who was well known all over Europe for his tight rope walking skills. It was a sport that became a career for him, and he was very popular for it. Often times, in order to excite the crowd who came to watch him, Mr. Tight rope walker often did this exercise blindfolded. He would walk from one end of one building to one end of another building on the tight rope, and he never slipped once. Sometimes, to create more excitement, he walked on the tight rope, blindfolded, and with a wheel barrow. Mr. Promoter was an American who heard about Mr. Tight rope walker. He was curious, and at the same time found it hard to believe that anyone could walk on a tight rope blindfolded, and with a wheelbarrow without slipping! He decided to invite Mr. Tight rope walker to America, saying to him "prove you don't have any tricks up your sleeve that aid you when you're doing your tight rope walking in Europe. Come to America where we can see for sure that you are able to do this." Mr. Tight rope walker agreed, and the event was widely promoted in the US. Mr. Promoter set up the rope and everything else that was necessary and watched as Mr. Tight rope walker got blindfolded, took a wheelbarrow and walked fearlessly on the tight rope without slipping once! Of course the crowd went crazy and Mr. Promoter felt ashamed. Mr. Tight rope walker went to him after the event and asked "do you now believe I can walk on a tight rope, blindfolded, with a wheelbarrow without slipping?" Subdued, Mr. promoter nodded. Mr Tight rope walker repeated his question, and Mr. Promoter, in frustration at being proven wrong about his assumptions, yelled "Yes Yes! I believe!" 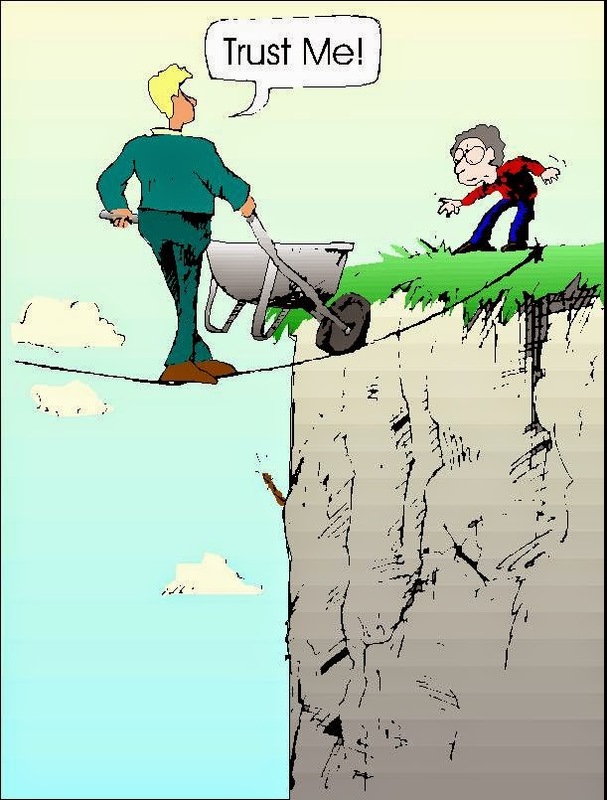 Mr Tight rope walker smiled and said "If you truly believe I can do it, get in the wheelbarrow". No prizes for guessing Mr. Promoter ran in the opposite direction. Many of us are like Mr. Promoter. We see God working in other people's lives, we see Him coming through for them in every situation, but we are too scared to get in the wheelbarrow and let him push us over a tight rope. We always imagine we will fall, we will fail, we think of all the things that could go wrong if we don't take control of our situation ourselves and though we believe God can do it, we'll rather sit on the sidelines than let him take us through our difficulty. It's a new month in this new year and my message for everyone is to get in the wheelbarrow! Hearing this story today reminded me of the verse God dropped in my heart at the beginning of the year- Proverbs 3:5- Trust in the Lord with all your heart. Lean not on your own understanding. Stop being the Mr. or Mrs promoter! Get in the wheelbarrow with God! He can walk on tight ropes, blindfolded without slipping! He can walk on water, He can calm the storm. If you truly have faith, jump, leap, swim, do anything you must and believe that God will always have your back! Happy February! I pray it brings you love, favour and happiness!